With bright sunshine heralding better weather and the real onset of spring, Swanage Railway hosted a 'Branch Line' weekend with an attempt to recreate the traffic of a branch line in the late 1950s. Three steam locomotives worked both passenger and demonstration goods services and two diesels worked passenger trains - the shape of things to come. 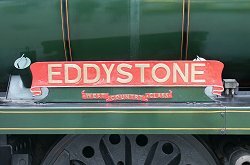 The weekend was a farewell to 34028 'Eddystone' before it departed for a year's service on the North York Moors Railway. 34028 'Eddystone' emerges beneath the Northbrook Road bridge as it starts away from Swanage. 34028 'Eddystone' passes the Northbrook MPD Swanage. 6695 and 80078 come off shed to join their last train for the day. 6695 pilots 80078 away from Swanage with a late afternoon train.